Studies show that 75% of the U. S. population is chronically dehydrated which exacerbates most diseases and helps to keep us unhealthy. 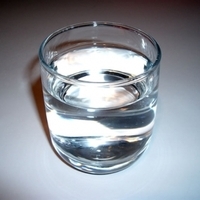 The average adult needs about eight 8-ounce glasses of water per day and overweight people need even more. Here's a recipe to help you get your two quarts or more per day. Ice can be added to reduce the temperature of the water if desired. Remove a glass, tumbler or cup from the cupboard and set aside. Obtain water from an approved source (bottle, barrel, well, spring or spigot). Thank you for your recommendation, our testing lab is currently working on something similar related to chocolate and hot water. We have, however, run into problems relating to "boiling" and future viability of the tongue. We understand that McDonalds has resolved this problem and our team of lawyers is looking into how they did it. Another problem with hot chocolate appears to be--to marshmallow or not to marshmallow. Thanks, but what we need is a really good recipe for "Boiled Water." I hear it can be used to make some great things, like tea!